- Enjoy reading; actually read. - The plan for the pictures is to click on the thumbnails for slightly larger pictures. - That's really all. Cat. As a lot of you are probably well aware of at this point, there is currently a rather interesting and unique bootleg around that combines the design of ITEM #60154 and the sculpt of ITEM #186. 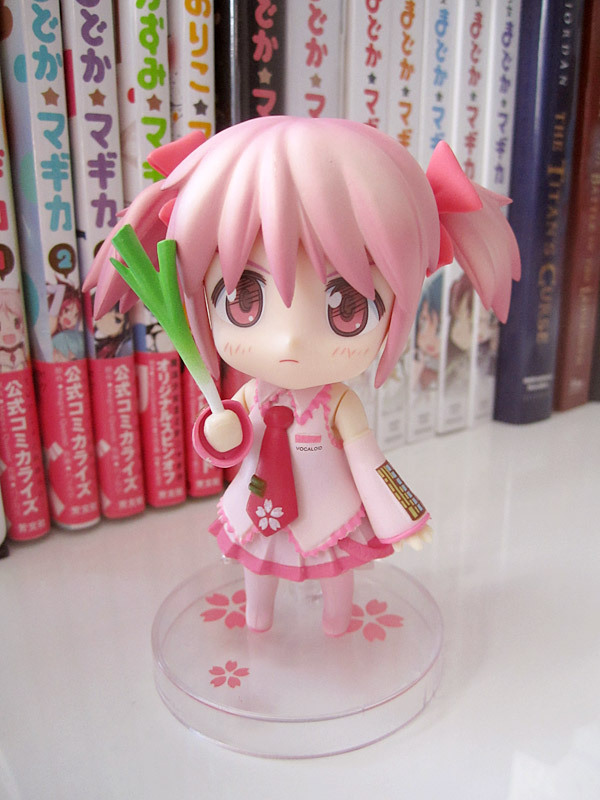 Most interesting of all, people's morals seem to have been thrown completely out the window when graced with the option to own such a cute figure. 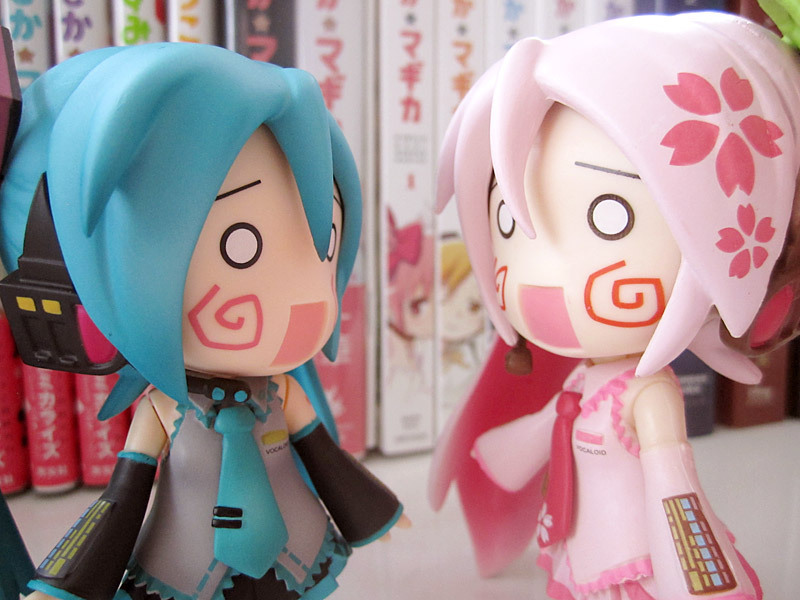 In this article I was going to originally make a full-on review, but BRS_is_Mai_Waifu has that pretty much covered. Instead, I give you some random pics and thoughts on the subject. magical girl censor to the rescue! As well as I can tell, there are two different variations, which differs in changes to box design and the nendoroids themselves. For sake of comparing them, we'll call mine "Cube ver." and BRS_is_Mai_Waifu's "Flower ver." based on the box designs. Which one is better? Well, that's all up to the user. Maybe it's up to Miku. 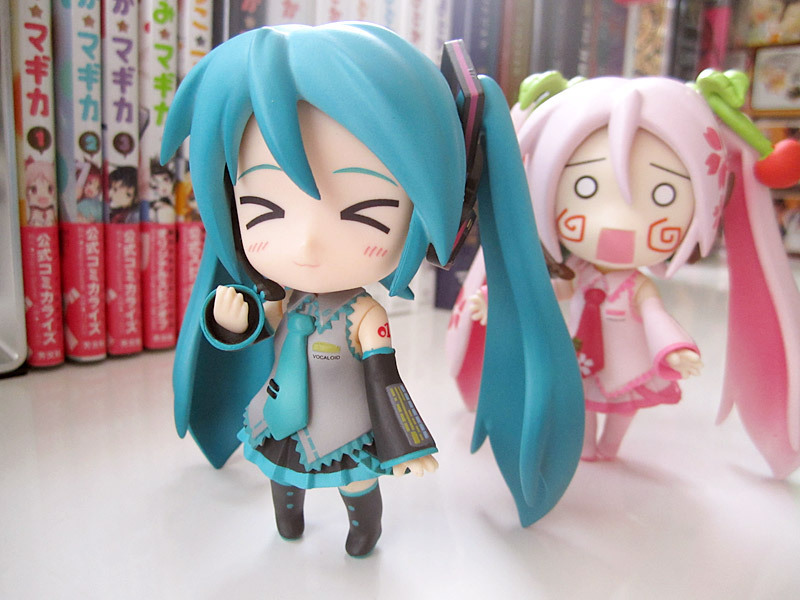 The original Miku of our family wanted to introduce this transfer Nendoroid for us, so let's see what she has to say. 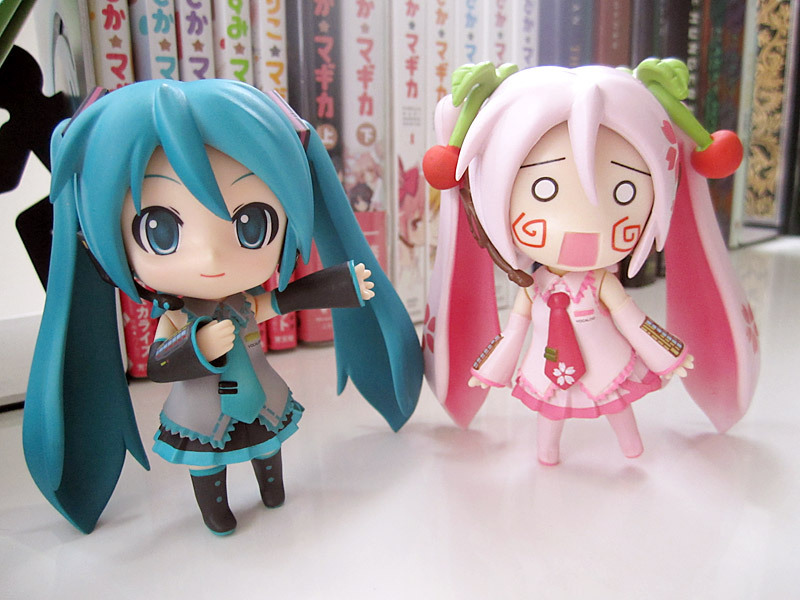 "Let's welcome Sakura Miku to the family! Introduce yourself!" -magical girl beating- "DA FK YOU DOING HERE? YOU STUPID BOOTLEG! WHY CHINA SEND YOU HERE? SPY. PINK IS MY COLOR, B*TCH!" "Kaname-san, instead of beating her, maybe there's a use.."
"Kaname-san!! Amazing, beautiful, perfection!! Like a goddess!" "Let's take a picture~.. pose!" Surely, the question that most ask themselves: Is she worth it? Well, I can say for me at least, not really. In the end it's just a badly made figure that will probably get made one day by GSC. 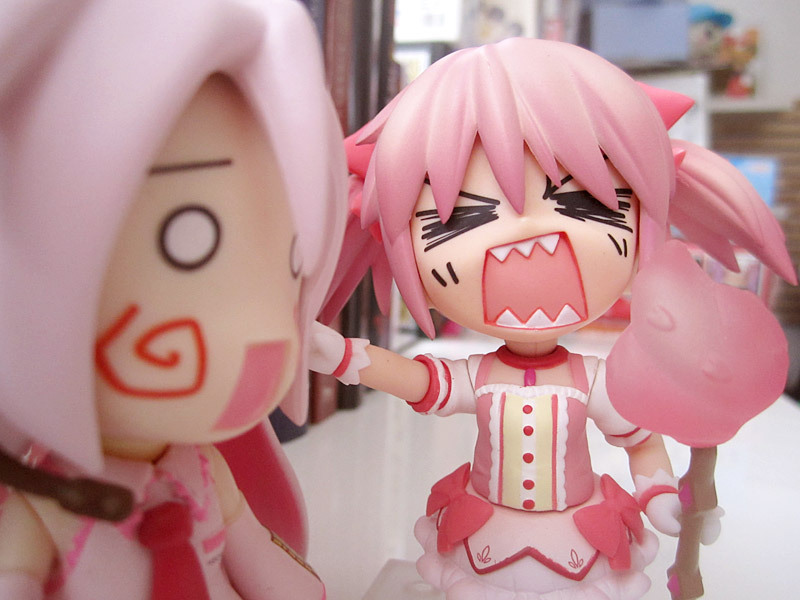 She may only cost around $20, but that's still $20 you can put towards a genuine Nendoroid that you really want. In the end, it's really up to you. Good luck! Would you consider this figure? 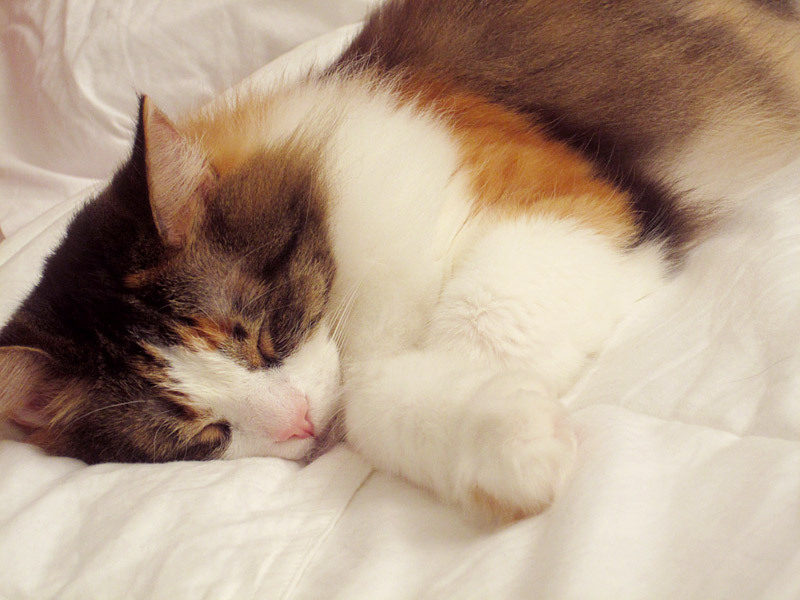 @Neko: Thank you ^^ You're welcome. @BRS: Can't say I agree with you there, they are both bad in different ways. There's no gloss on mine. You've made some great points here, and thanks for posting this! @hilda: I look forward to that! Yes I've seen many bootlegs at cons, and they are just god awful so I was not sure what to expect here, she's better than I thought but still not worth buying in my opinion. Really makes you appreciate the quality of the real thing! Yup Madoka looks cute, still want to get her shellington's outfit! @shinigamimaid: She's surprisingly better made than some other bootlegs out there I've seen, but I won't even buy one for customizing! I just don't see the point. Especially if you're gonna put so much work into it and make it into a OOAK masterpiece, use the real thing so you get good base material! what do you mean spot the things in the background? Yup, I put her in the far corner of my desk and she's quite cute there but even from here stands out since she lacks shading and such. I hope most people closely examine their Nendos considering how much they cost! I'm sure official sakura miku will. 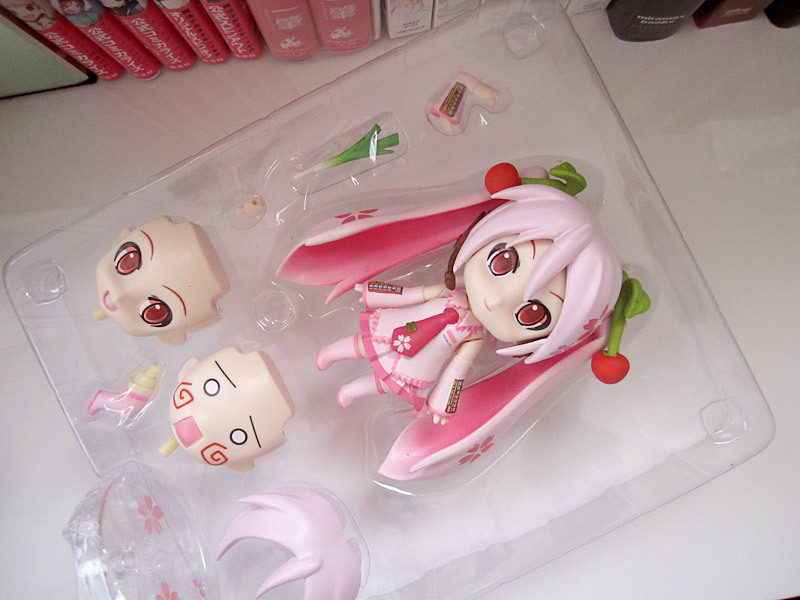 @imanov: Ehe yeah she is kinda cute, even for a bootleg. Hm my seller was lighting-smile you can't trust the pictures the ebay people use. The seller I bought from used different pics than the one they sent me. I hope you also notice the red eye shading and stuff in the eyes. The other one has issues in the eye decals as well. Overall I say just wait for the real deal! I'm certain GSC will make one. Miku is guaranteed money. Could you link us from where did you buy yours? Searching eBay I only find the one Mai Waifu got and I prefer yours. She looks kind of cute if you don't examine her too closely. 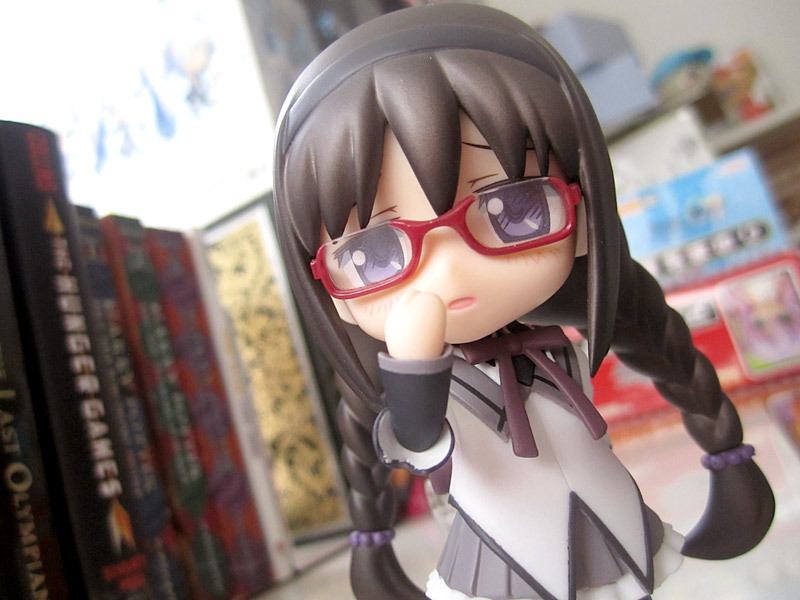 Unfortunately when I get nendos I do like to look at them closely and appreciate the detail. 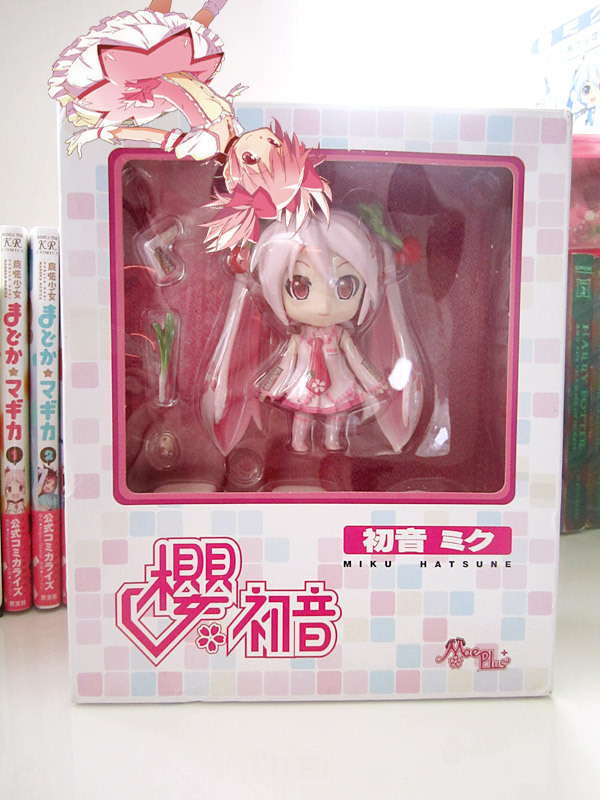 Here's hoping an official Sakura Miku will appear one day. 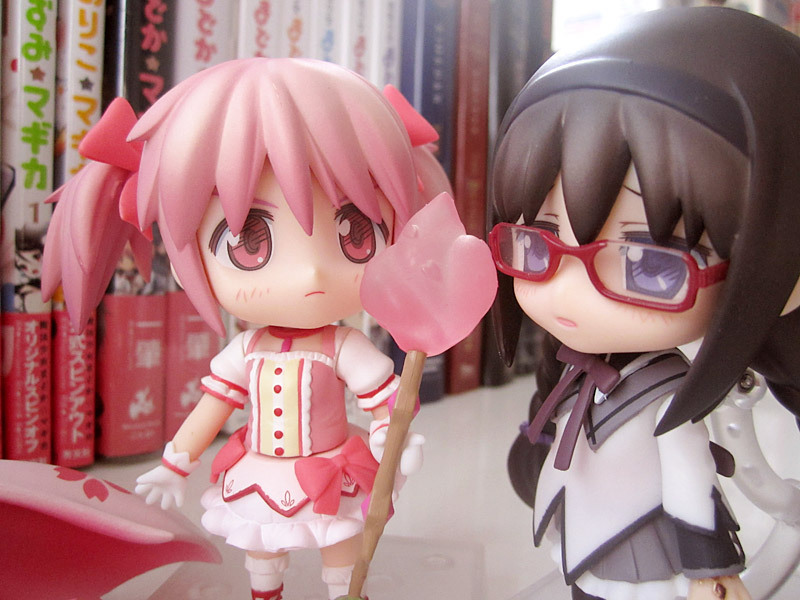 The outfit is pretty from afar... at least Madoka's getting some wear out of it! 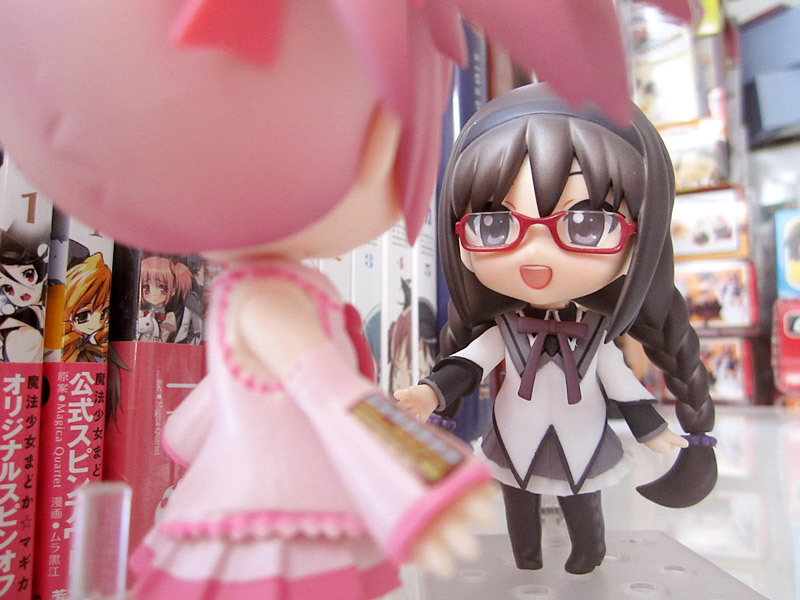 DvalinnThat's the scariest Madoka I've ever seen! I was half expecting her to pull a Charlotte on little Miss Bootleg. She looks good in bootleg outfit though. Still, bootleg. 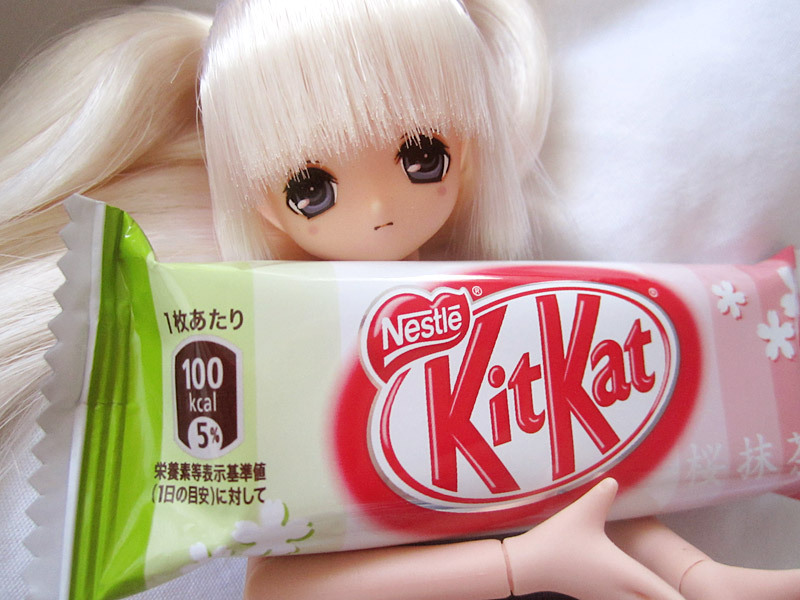 Wouldn't buy it myself, even buying a mountain of Kitkats would be a better investment. 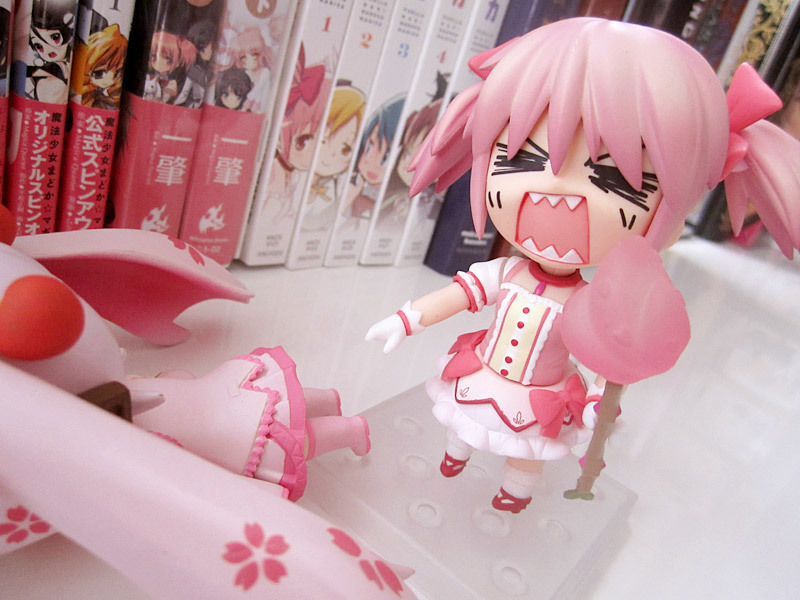 Hahahaha yeah, Madoka is the boss around here. Well, her and Saber. Same, I won't be buying another bootleg again. It's just not worth it, rather paint my own or something. I'd rather have treated myself to dinner XD oh well, at least it was fun to make this post! 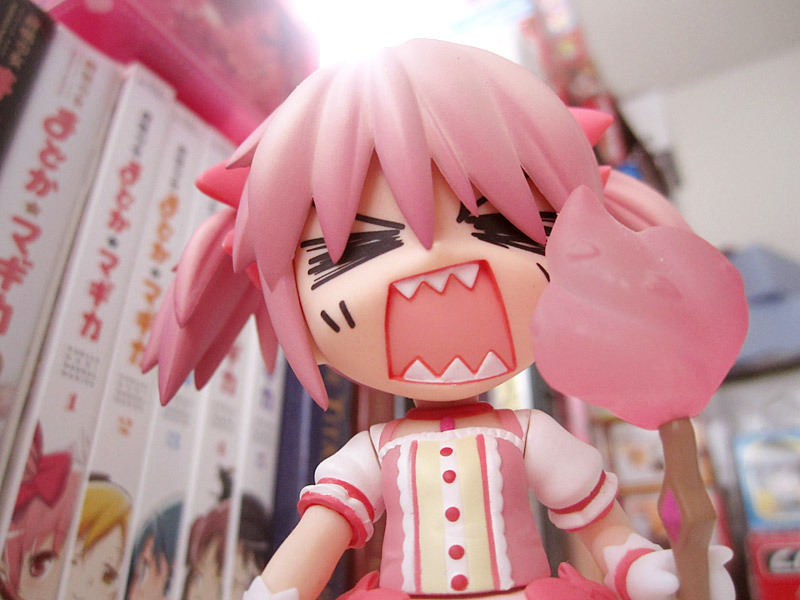 That's the scariest Madoka I've ever seen! I was half expecting her to pull a Charlotte on little Miss Bootleg. She looks good in bootleg outfit though. Cats, magical girls, and a tired flight home.